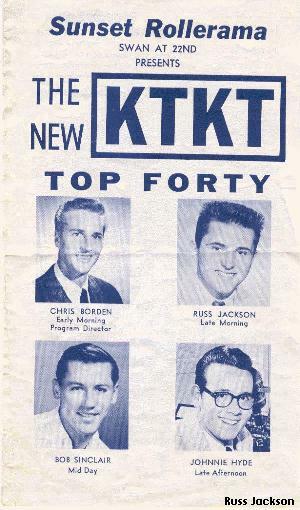 During February of 1959 KTKT expands to four DJ’s daily with the addition of newsman Russ Jackson to a midday DJ shift. Alan Dean is replaced by Bob Sinclair in the early afternoon. Here is a listing from the Star documenting these changes. April of 1959 ushers in more change at KTKT. The big news is Frank Kalil returns to Tucson and resumes his afternoon drive program. Bob Sinclair moves over to do the 9 AM show. Alan Carroll returns to the DJ line up at Noon. During 1959 Alan Carroll also voices a liner used to end KTKT newscasts that goes “if you don’t want it heard on KTKT news …don’t let it happen “using a moderate to heavy amount of reverb. I wonder if anyone at this time imagined that this liner would be in use at KTKT until early 1968. Jack Gilbert also joins KTKT early April to do news, weekend fills and also the 6 pm to sign off DJ program. John Hyde goes to KCUB AM 1290 in the afternoons. KCUB is presently doing a half-hearted top 40 format – “chicken rock” –not being sure if they want to go all the way with new rock and roll thing. Johnny later moves on to KAIR where he was also program director. In later years John would go on to great success at KROY in Sacramento. Russ Jackson would later work at KAIR, KMOP and KTAN AM 580 in Tucson. This DJ line up mostly stays in place for the remainder of 1959. The only changes occur when Jack Gilbert leaves during July. Alan Carroll temporarily does extra duty doing the 6 PM show in addition to his own shift. Don Wayne comes on board during August to do the news and the 6 pm DJ shift. But by late fall Don Wayne is gone and is replaced by Dave Nelson who does news and a weekend DJ shift. Dave will be become a full time member of the KTKT air staff after a big changes take place at KTKT during the following year.